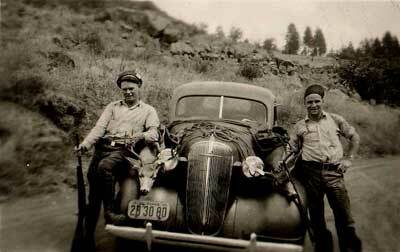 These two nice bucks were taken north of Eagle Lake around 1940 by Curt Heuson (left) and Jim Case. Notice the bucks are lashed on the fenders of the car  a common practice at that time and for some time thereafter. Curt Heuson and Jim Case were hunting the mahogony breaks north of Eagle Lake. They had rendezvoused to re-plan their hunt as there was another group of hunters over the ridge from them. After they had made their plan and had just started to separate, a buck stepped out of a choke cherry patch. Curt saw it and started to aim when he noticed movement behind that buck so he didn't shoot. The movement was another buck but he again saw movement behind it  a third buck stepped out and Curt dropped him. Still more movement and a fourth buck stepped out and Jim dropped him right on top of Curt's. Two more bucks stepped out, larger than the two they had shot. These were young guys who knew how to hunt and if they had taken a chance and waited, who knows how much bigger the fifth and sixth bucks would have been. I was fortunate enough to have a Curt for my dad. He taught me how to hunt and track. He was taught by a fellow named Marcus Alverez who was originally from San Juan Bautista, just northeast of Salinas. Jim Case was called up to the Army shortly after this hunt and was with Patton's 2nd Army in Europe. Jim never returned from Europe; he was lost in the Battle of the Bulge on December 6, 1944. Curt lost a hunting partner that year but also gained one as I was born in November 1944. It was great growing up in Susanville, California, and learning all the good places to hunt. There are names of places up there that have a ring to them  Rumstock Canyon, Deamo Ridge, Bloody Point, Horse Lake, Williams Creek, Painter Flat, Dixie Mountain, Fort Sage, and Pete's Valley, just to name a few. I feel that it is time for the stories of guys who hunted in the early 20th Century in California to be told. Editor's note: We want to thank Ron for his submission and we agreed that we would like to see more stories about the Good Old Days of hunting. Have a story or picture from the Good Old Days (prior to 1980)? Send it to us via e-mail or snail mail at WesternHunter.com, P.O. Box 7708, Stockton, CA 95267-0708.